Well. I do believe that this is the first handknit I’ve finished for my own baby! 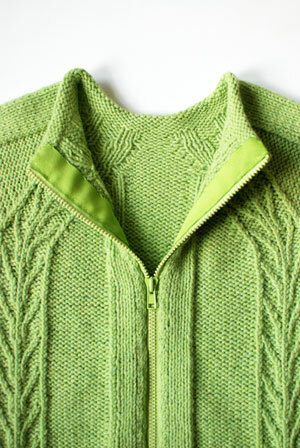 Pattern: Twisted Tree Pullover by Blue Garter’s Sarah Pope. I more or less followed the instructions for the smallest size, tweaking the numbers a bit, so that the cardigan ended up with a smaller chest circumference than the 1-year-old size. 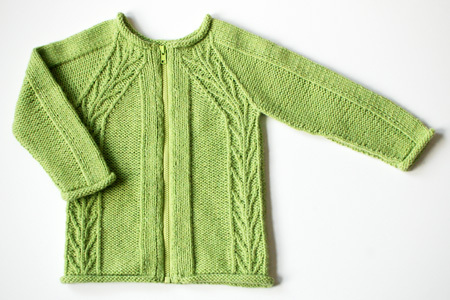 And of course I cardigan-ized this pullover pattern. Yarn: Classic Elite Princess in #3495, Ladylike Leaf, about 2.5 skeins. Needles: US 4 and US 6 circs. 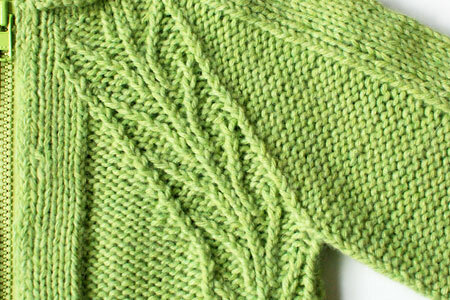 Using the larger needles, my gauge was about 5 stitches per inch in stockinette stitch. Finished measurements: About 20″ chest circumference, 8″ sleeve length to underarm, 13.75″ shoulder to hem. As I remarked earlier, this is definitely skinny and tall for a baby sweater, but I’m not opposed to rolling up sleeves and such. Baby knitting books tell me that this size should fit some time between 6 and 18 months, depending on the baby’s build. So, he should be able to wear the cardigan this winter, as I wanted! Zipper: Fortunately, installing fully-lined zippers is not new to me, so the process went fairly smoothly. I finished the cardigan edges and shortened the separating zipper just as I did for the Budgie (instructions in the pattern), and then it was just a matter of some hand-sewing. 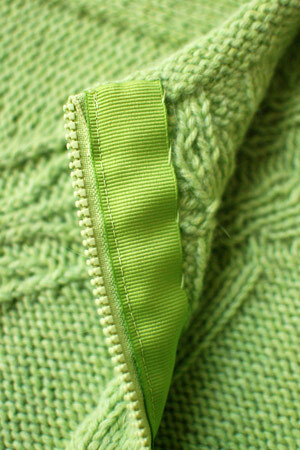 Many folks have recently mentioned TECHknitter’s “inserting no-sew zippers into knitwear” which is a great technique. For this sweater, I wanted to fully line the zipper tape from top, bottom, and sides, and decided stitching it in by hand would lead to a better result. The “twisted trees” are my favorite part of the pattern, and I think the yarn shows off the stitches beautifully, much better than the handpainted blue yarn I tried initially. The sweater I ended up knitting out of the blue yarn is just about finished, too! That’s a really nice pattern. The sweater looks great and I’m guessing your baby will have brown hair and that color will be a nice match. Also it’s nice to wear spring colors in winter! Wow! I like this sweater. You have made it with a great color and the stitching really stands out. lovely! and love how neat your zipper is- I always get impatient sewing them down! I never thought of lining the zipper – that’s a great tip! Sweater is gorgeous – can’t wait to see baby wearing it! YouR finishing skills are impeccable! Beautiful job. How lovely! That is going to be one well dressed baby (not that any of us doubted this would be the case…). Now that’s adorable! You’re going to have one well dressed tyke! Beautiful. I love this sweater and I am very partial to cardigans so I love your cardigan-izing of it. Did you sew the ribbon by machine? Those stitches (on the left side of the ribbon) look too too perfect for hand sewing! I love this pattern and would love to make it exactly the way you’ve done but could never in a million years cardiganize a pullover. Kudos to you for doing that and doing it so well! Your little one will look great in it! I love that sweater, and the color, too. I hope you’re feeling well. 🙂 What, no belly shots? So precious and perfect. Lucky baby. This is beautiful, and I love the zipper! Hooray! It looks great in spring green. You might have to roll back the sleeves a bit at first, but it’s also nice to be able to cover those little fists when it’s crisp outside. And I think you’ll like the extra torso length — the sweater won’t ride up around his armpits when you pop him in the car seat or the carrier. It looks great! How wonderful to use your knitting skills for your little one!